HP DDR4 SmartMemory for Gen9 Servers provide 14% better performance in rack and tower servers. DDR4 SmartMemory for Gen9 Servers have 33% better performance in HP BladeSystem enclosures. HP SmartMemory enables HP ProLiant Gen9 Server series to reliably identify and confirm that installed memory has passed the rigorous HP qualification and testing. That means you are getting genuine HP Qualified Memory for optimal, reliable performance. Verifies that your memory has been tested and performance tuned specifically for your HP ProLiant Servers. Most third-party memory vendors simply don't do this or aren't capable of platform-level testing. 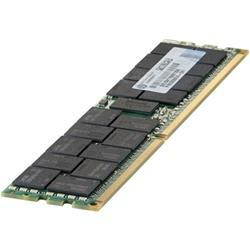 HP SmartMemory is sourced only from Tier 1 DRAM suppliers. When used in conjunction with HP OneView, SmartMemory enables fault prediction capabilities. If potential problems develop in one of the DIMMs, HP OneView lets you know in advance so you can have the DIMM replaced, before it fails, under warranty. HP DDR4 SmartMemory has 37% lower power than DDR3 at the same speed. DDR4 SmartMemory allows closer DIMM spacing enabling less expensive CPU heat-sink.